What is Holistic Lifestyle Coach Level 1? Do you or your clients suffer from nagging shoulder injuries or problems due to instabilities with ligaments or tendons? When you’re trying to rehab problems like these, you may want to start with rhythmic stabilization, a technique I learned about many years ago while I was studying orthopedic rehabilitation and the subject of this video. As you’ll see, you can practice rhythmic stabilization by using a variety of tools, from a body blade and Swiss ball to DIY solutions such as filling up a tube or Mason jar with sand or water. Suppose you have an injured shoulder or rotator cuff. When you make the body blade oscillate back and forth, you’re activating the agonist muscle while the antagonist muscle works to control the movement of the joint. 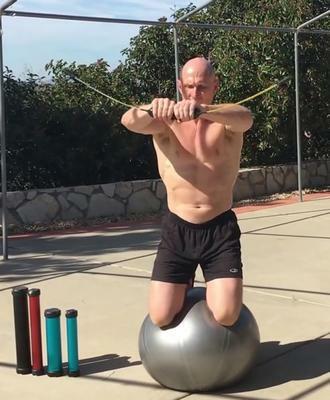 As soon as you pull backward, the antagonist becomes the agonist or the working muscle. In other words, the two flip back and forth from working to controlling. There’s a constant oscillation of the muscles on either side of the joint in their roles and primary functions. This oscillation also sets up a pumping mechanism. For example, if you have a joint capsule injury (capsules, ligaments and tendons don’t have a big blood supply), you’ll want to use low intensities but pump the muscle to bring a lot of blood in and pump the lymphatic system to remove waste so tissues heal faster. These exercises are also very useful for identifying differences between the dominant and sub-dominant hands and areas where the motor system needs more improvement. This is important, especially when you compete in sports like martial arts or boxing. If you tend to be dominant on one side or the other, you’ll sustain sports-related muscle imbalances that create torsion around joints. Plus, that left-right symmetry leads to problems later on too. There’s a science to doing this correctly too. 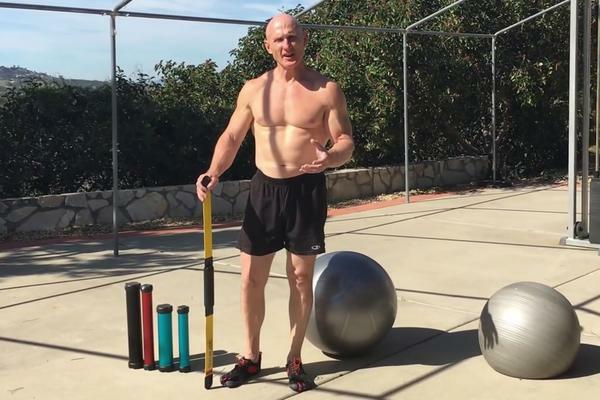 The skills I teach in CHEK Exercise Coach and C.H.E.K Practitioner and CHEK Holistic Lifestyle Coach programs give you the proper assessment tools and the specific knowledge you need to know to perform rhythmic stabilization exercises with precision accuracy. Paul Chek is an internationally-renowned expert in the fields of holistic health, life coaching, corrective and high-performance exercise kinesiology. For over thirty-two years, Paul's unique, holistic approach to treatment and education has changed the lives of countless people worldwide, many of his clients, his students and their clients. By treating the body-mind as a whole system and finding the root cause of a problem, Paul has been successful where traditional approaches have consistently failed. Paul is the founder of the C.H.E.K (Corrective Holistic Exercise Kinesiology) Institute, based in California, USA and the Chek 4-Quadrant Coaching Mastery and P~P~S Success Mastery Coaching Programs. Copyright © 2017 - 2018 CHEK Institue | All rights reserved.